Like I said, I’ve been trying to eat better. So when you want to eat healthy, what do you do? You stock your fridge full of healthy foods… Brussels sprouts, romaine, spinach, carrots, bell peppers, artichokes… but after about a week you can’t eat carrot sticks, boiled artichokes and garden salads any more without turning some off hue green or orange color. This is when creativity, ethnicity and a little inspiration become true heroes. Say hello to health goodness and goodbye to health “bleck”. If using a fresh artichoke, cook before hand (by boiling for 45-50 minutes, or grilling until soft). Remove the leaves (and eat! Maybe as your appetizer? Yum!) and dice the heart into 1/2 inch pieces. Heat the oil in a frying pan over medium heat. Quarter the Brussels sprouts and add to the hot oil. Saute, flipping every few minutes, until soft and golden brown on the edges (you may need to increase the heat to medium-high after the Brussels sprouts are soft, to get the roasting coloration). Remove from the heat. Saute, bake or grill the chicken breast as desired. Cut the chicken into strips and set aside. Combine the ingredients for the dressing and whisk together for about a minute. 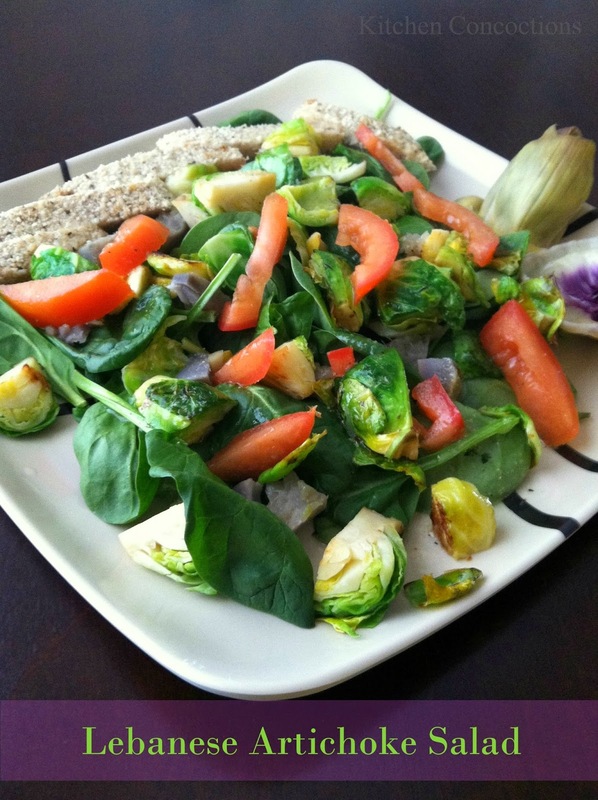 Assemble the salad, beginning with a bed of spinach, then adding the artichoke hearts, Brussels sprouts, tomato slices, and chicken strips, then drizzle the dressing over the top.